I have a UPS, but after a few years the batteries no longer held a charge, and I have yet to buy new batteries for it. That and with my Workstation putting it under a 500 watt load, it only gave me 10 minutes of power at best. So being I have had good luck with reliable power from my local utility I decided to not use it anymore. Then today I lost power. Naturally you loose power when you are in the middle of something important. Thankfully some recent purchases for another project saved the day. Here is my redneck solution to backup power. Ok maybe this is not really a UPS, since obviously my power was interupted. But this worked great. 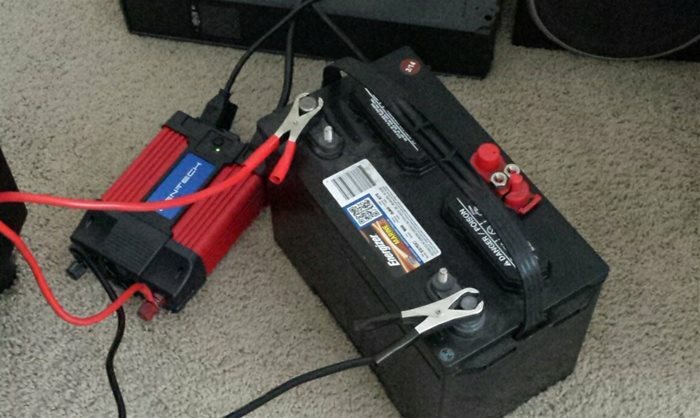 I used a 12V Deep Cycle Battery rated at 115 Amp Hours I bought from Samsclub for about $100 (after core fee and taxes ), then a 1500 Watt Inverter I bought for about $40 from Harbor Freight. The Inverter can do a 1500 Peak Load, 750 Watt continous. My computer setup ( computer, 5 x LCD screens, speakers ) uses about 500 watts idle. I originally bought this setup because I needed a way to provide power to some Club lights that were going to be mounted at an outdoor venue, and there was no way to run extension cords from the main building. Initially when searching for a solution I looked at generators. Ideally a 1000 watt or 2000 watt compact Honda generator like the EU2000i or the EU1000i. But these cost about $1000. Plus I don't like the thought of keeping a gas powered generator in the trunk of my Prelude, its really hard to get gasoline odor out of your interior should there by a spill. My next thought was surely someone would have created a power pack device with a battery plus inverter all in one. And they have. There are a few brands and models to choose from, but harbor freight had the best deal with their Cen-Tech 5-in-1 portable power pack. These work great for smaller loads, but there were limited to about 15 AH of power. This means I could run a 175 watt load for maybe 1 hour. I needed something with a much higher Amp Hour rating, as I was going to be running 650 watts for about 6 hours. Then it dawned on me, that all I really needed was a huge deep cycle battery and an inverter. Harbor freight had the inverter for a mear $40, and Samsclub had the Deep Cycle Batteries. The idea was to drag the battery and inverter to my Gig, use it, then bring it back home and throw it on the car charger when done. Then today while working on patching some code on a few websites, I lost power, and I needed to get back online ASAP. So I used my Redneck power setup, and was back online in minutes. I am not sure if the power from the inverter is very clean, as I was getting a annoying whine coming from the power supply on my computer, but everything seemed to run great. I continued to work for 90 minutes without any issues. The only noise was the whine from my computer's Power Supply and the fan on the Inverter, which sounded like a very low power hair dryer. Still much quiter than a Gas Generator. After power came back on, I took the battery back to the garage and put it on the charger. Its similar to a car battery except they are made with thicker plates and are designed to hold more energy. They are often used in RVs, Campers, and even Wind and Solar setups to store the power. Why a Deep Cycle Battery? Thats what many people are wondering? The first reason is Deep Cycle batteries have higher Amp Hour (AH) ratings that regular car batteries. Plus they can be discharged to very low levels 20% or less, without causing any damage to them. Car batteries on the other hand don't like their capacity to drop below 50%. You can do it but the life of your battery will be reduced. Why not a Lithium Ion Battery? Cost is the main reason. Granted pound for pound Lithium Ion will hold more energy than any Lead Acid battery. But with Lithium Batteries you need a special charger for them, plus they are expensive. I am talking $1000+ for a comparable battery. Lithium ion batteries are more ideal for when you are trying to loose weight in your application. I don't mind dragging around a 60 lb Deep Cycle. So if you need backup power for extended periods of time. Get a Deep Cycle Battery and an inverter. Most cost effective solution I have yet to find.